Measures 8" x 7" x 7". The Man Can is a hand delivered gift. These gifts are delivered by one of our local design centers located throughout the United States and Canada. Same day delivery is available for most gifts when ordered before the cutoff time. The cutoff time for The Man Can is 2 PM in the recipient's time zone. Licorice Fisherman's Scrub Soap, Spicy Shave gel, and more. Arrives presentation-ready in a stylish reusable Man Can. All natural skin care products made in the USA. I have a male friend who was in the hospital recently. He LOVED receiving something different instead of the normal flower and balloon delivery! I am very happy with the gift, although the price with shipping was outrageous. I think the price is way too high. My bother loved his Man Can! Good quality, cool presentation & delivered in just a couple of days!! Will be ordering more from Gift Tree this week!! For the Man who needs to make for himself and take of himself, this is the ultimate gift for that special man in your life. It was loved and appreciated greatly that the thoughts of care were so evident in this gift. IL highly recommend this for the man who is who always on the go, and needs time for himself to refresh his mind and soul. When my son called to thank me he was really impressed with his gift. He loved every thing in it. I will definitely be ordering from you people again. Thank you so much for a great product. I sent this to a friend as a get well gift. He was definitely not a flower guy. He loved it and his wife is still raving about it. She already has a list of guys she wants to send it to! My son loved his birthday gift...THE MAN CAN!!! His eyes lit up in wonderment (like a child at Christmas) as he explored the contents of the "PAINT CAN". We both loved the nice clean manly fragrances. I just cannot tell you how great the "Man Can" was received by my husband for Valentine's Day! My husband was absolutely wowed by this gift, made especially for men. He loved the manly soap, scrubber, the after shave and even the hand butter. He said, "Finally! Something just for us! Even the Can is manly!" When my daughter heard what I was getting her father, she wanted one for her fiance, too, so I called back and ordered another one! Everything in the can was of great quality, and the gifts arrived right on time for Valentine's Day. Her fiance roared and laughed about the Man Can, and he loved everything in it! It was a hit with both men! It is so difficult to find things for holidays and special occasions that aren't feminine in their presentation, but Gift Tree made our Valentine's Day for our masculine men too! I really think this gift would be a hit with any man! Please do bring in other gifts that are 'just for men'. We'll be looking for them! A Million Thanks! This was a gift for my grandson, who is always telling me he lives in his man cave (room), so when this was sent to him, he loved it. Thank you!! Perfect for the man who has everything! Here is the email I rec'd from my Dad... "Just wanted to say thank you for my Christmas goodies - -a really cool and different idea! The sponge is great and already in my shower, the soap is in the wings as I am currently finishing up a bar, but smells wonderful. 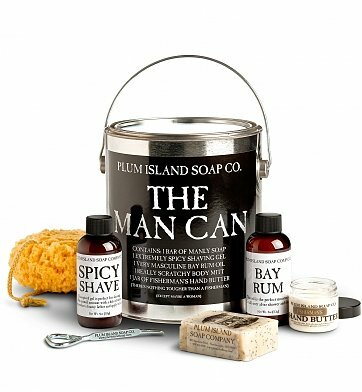 The Shaving Spice and Bay Rum are great and work well (Bay Rum is really aromatic). The hand cream is being used daily now that winter is here and has a very pleasant aroma and is not greasy. Finally the paint can in which all arrived is in the shop awaiting my next project. Thanks so much! " We sent this to my brother for his birthday. He thought it was a fun presentation filled with great toiletries that he "would use to smell better". This is a great gift to send the man who has everything. Everything was wonderful. Timely delivery and great presentation. I will definitely use Gift Tree again! Thanks for doing a nice job! I bought this for my son-in-law. I was kept in touch the during the whole process. And when he got his gift, he was thrilled with the presentation. I'll order from GiftTree again! My husband was very intrigued when he got a "paint can" in a box for his birthday. It was fun watching him open and smell each item. He's pretty sure they won't last too long, since he couldn't wait to try them out. I purchased this for my husband as a Valentine's Day gift and he loved it! He was very impressed and surprised by the packaging. Innovative and fun, he thought I was subtly asking him to paint the house! He really enjoys the products and loved all the scents, and believe me he is a picky one when it comes to any kind of scent. These products smell clean and fresh and very masculine. A great gift for any guy in your life. I highly recommend it. I bought this for my son for a surprise Valentine's Day gift. Chocolates will not work for him as he is in extreme football training mode for college football. He LOVED it. He said that all the products are perfect. "Thank you" AGAIN Giftree, you all make me look amazing, both professionally and personally. Sent this for my boyfriend for Valentines, he just received it and he liked the smell when he opened it and that he didn't want to take the stuff out of the can lol! It was shipped on time. Thank you for this wonderful and unique creation. Happy camper here. You'll be my go to gift site from now on. This was the perfect gift for my husband who has literally everything. He loved it!! Thank you for making a wonderful gift for the men in our lives" we have a thieves gift at Christmas. This will be the 1st there will be a true mans gift. I will be the hit. Keep up the special gifts! hopefully my husband likes this and will motivate him to do something with his beard! Looks exactly as shown. Very nice. Can arrived dented although outside package was fine. Replacement sent another gift, no questions asked. Rep was helpful and extremely nice. The Man Can is so manly. Love the can but I don't know if my boyfriend will like it. Hopefully he will. I'll make sure he reviews it as well. The package arrived before it was supposed to (which it was great), it can well protected and it was easy to track. My dad loved this gift so much. Very creative! I sent this Man Can to my dad for his 75th birthday. He LOVED it. Especially wonderful is the fisherman's hand cream. Thank you for compiling the PERFECT man's gift. The Man Can - PERFECT! I ordered the Man Can for my son for Father's Day. It was just perfect! He really likes it! Thanks for offering a "manly" gift! Purchased for a supervisor living in NYC as a get well gift. His response was "I've never seen anything like it" - for a resident of NYC to say that, says it all. That was the key! My friend got very surprised when he received it and liked the packaging instantly! The contents are very useful for him too! Purchased for my uncles's 65th birthday as a fun unique way to help keep himself looking YOUNG..ha ha He got a kick out of it! I like finding new and unique gifts for my husband and this was great. The products have a licorice scent to them, not overpowering. Awesome gift for the hubby. Well dreserved. The receiver really liked it. The Man Can was great and I gave it to my fiance on Father's Day and he loved it. Plus, once you empty it out you can use it for other guy things. All and all the products were really great for the Manly Man and he liked everything about the gift. It was a great choice and I recommend.